A will-to-design (will-to-order) and an understanding of architecture as a response to the reality are two primal forces or tendencies in thinking / doing architecture. While the conflict between these two forces is founder of architecture and its articulation allows to discuss and identify key aspects of contemporary architecture production. The Wittgenstein’s House is brilliantly inaugurated by Jan Turnovski as an example of the discussion. 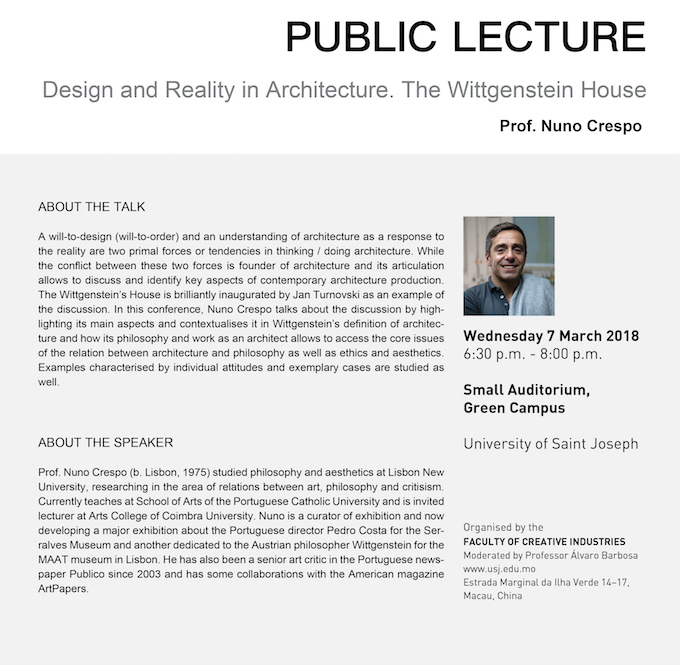 In this conference, Nuno Crespo talks about the discussion by highlighting its main aspects and contextualises it in Wittgenstein’s definition of architecture and how its philosophy and work as an architect allows to access the core issues of the relation between architecture and philosophy as well as ethics and aesthetics. Examples characterised by individual attitudes and exemplary cases are studied as well. Prof. Nuno Crespo (b. Lisbon, 1975) studied philosophy and aesthetics at Lisbon New University, researching in the area of relations between art, philosophy and critisism. Currently teaches at School of Arts of the Portuguese Catholic University and is invited lecturer at Arts College of Coimbra University. Nuno is a curator of exhibition and now developing a major exhibition about the Portuguese director Pedro Costa for the Serralves Museum and another dedicated to the Austrian philosopher Wittgenstein for the MAAT museum in Lisbon. He has also been a senior art critic in the Portuguese newspaper Publico since 2003 and has some collaborations with the American magazine ArtPapers.